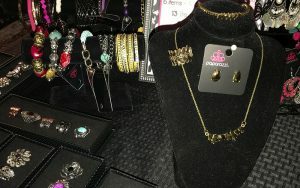 PHOENIX – Selling jewelry, clothing and food wasn’t the only idea behind La Luna Markets. Giving residents an opportunity to skip crowded retail lines and the ability to shop local were also top goals on the minds of the organizers. During Small Business Saturday, Azukar Coffee Shop, a South Phoenix cafe, hosted the market, an event for a community where residents said they have witnessed their fair share of neglect. 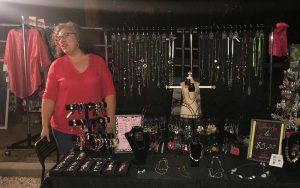 Amanda Ruiz, a vendor at La Luna Markets, runs her small jewelry business and lives in the South Phoenix area. Ruiz said she is tired of seeing her community forgotten. “I find that often times people do not even come down Central, they go to Laveen or Ahwatukee, they go to different areas for the same things we can offer the community here,” Ruiz said. That is why Ruiz and about twelve other vendors from around the South Phoenix area decided to do something about it, thus, La Luna Markets was born. “We have a lot more than just shops. We have a local honey farm that is here, we have Vegan Organic Baked Goods that comes out. We also have a food truck that comes,” Ruiz added. The vendors at La Luna Markets not only wanted to show the South Phoenix community the trinkets they could buy in their own backyard, but they also wanted give residents a place to come together and share much more than products. “It is about building community. It is just not a piece of jewelry, it is about getting to know the person,” Ruiz said. She added local vendors hope the market will bring new business to the area, while helping to build a sense of pride and recognition for the southern neighborhood. Andrea Brown, another vendor at La Luna Markets, has been running her small business with her husband in South Phoenix for the past two years. Brown adds that by shopping local, buyers are supporting so much more than just the vendors. Organizers said La Luna Markets will be open the first two Saturdays in December at Azukar’s Coffee Shop on Central and Baseline, giving the community more opportunities to shop local during the busy holiday season.